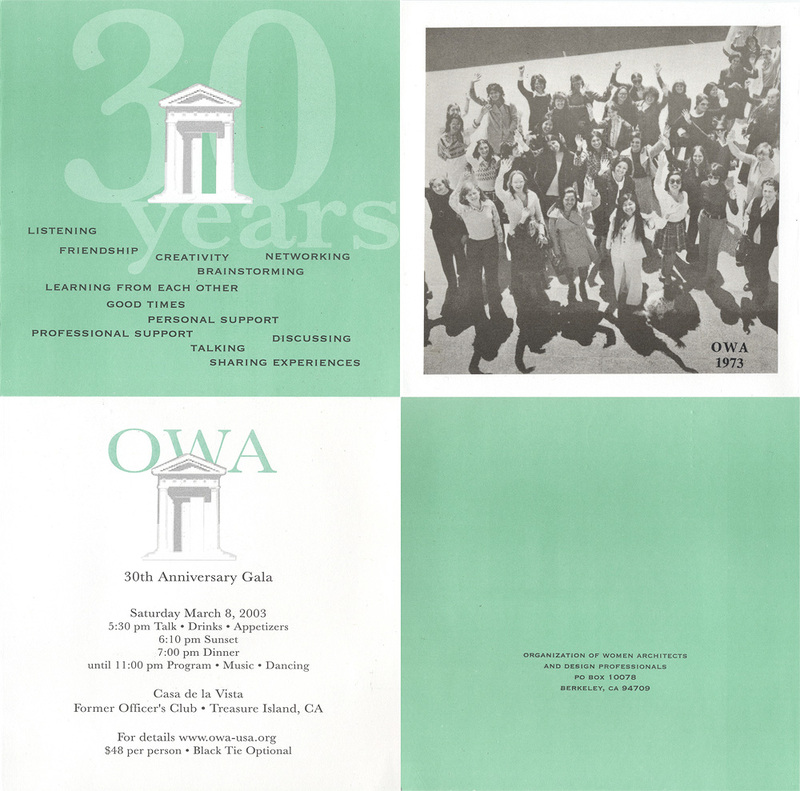 The OWA Steering Committee and the 30th Anniversary Celebration committee are finalizing the event dates for the coming year. To offer advance notice of these events, tentative dates and topics are listed on the right hand side of this page. In addition to the regular bi-monthly meetings, special events are listed as well that various groups of members may consider organizing around. We hope that this information will entice you to join the various activities that pique your interest. Come and start our holiday season with our traditional benefit event for the homeless shelter. Bring unwrapped gifts for men, women or children. Gifts will be donated to local shelters in time for the holidays. Since last year, the shelters prefer that we do not wrap the gifts. This will aid them to distribute them appropriately. Our trip to Ecuador is filling up: at the last retreat 11 members signed-up and an additional five are on the maybe list out of 12 spaces. The group includes architects, planners, landscape architects and engineers. The group also encompasses diverse cultural backgrounds which will enrich the experience. The $500 deposit is due at the end of October, sent to Marda Stothers at 2600 Warring Street, Berkeley, CA 94704. Call her at (415)977-8031. Marda is the overall trip coordinator and our member Gilda Puente-Peters from Ecuador will be leading the trip. The trip budget is expected to be around $ 2,000.00. This will include round trip tickets to Quito, lodging, and in some cases breakfast and local transportation. We are currently contacting local architects in Quito to plan some activities together and visit some offices. We also plan to visit the Colegio de Architectos, equivalent to the AIA, and will share a "parrillada" (barbecue) with Gilda's colleagues at a colonial farm outside of Quito. We will be visiting several Andean cities and small villages. One of the highlights will be viewing the colonial architecture in downtown Quito, dating to the 1600s, with its many churches, cloisters, museums and civic buildings. The modern northern part of Quito has many places of interest; we will enjoy the culture, local cuisine and scenic views. The trip starts at 9,000 feet and only goes up from there!! Ecuador is a small Andean country with a large architectural and cultural diversity. We will be visiting the Avenue of the Volcanoes, staying overnight at different colonial haciendas, tasting the local food, meeting artisans. We will take side trips to local markets, natural hot springs, folklore clubs. You will have the opportunity to stand on both hemispheres at the Equator. Please refer to the Sep/Oct Newsletter for complete trip itinerary. Where: Casa de la Vista on Treasure Island. The newly renovated former Officers Club, the Casa de la Vista, is located on the corner of California Avenue and the Avenue of the Palms. Easy to find, it is just a block or two inside the old Naval entrance guard gate. We are still recruiting volunteers, so if you would like to join our committee or help out on the night of the party, please email Betty Woo. We also would appreciate help locating and obtaining donors willing to contribute $500.00 or more to sponsor this event. If anyone has a favorite vendor or supplier and wouldn't mind asking him or her to sponsor, your assistance will be welcomed. If you think they might be a good candidate for sponsoring but don't want to ask, please forward his or her name to Kathleen Cruise. Kathryn Anthony, professor in the School of Architecture, University of Illinois, is also an associate faculty in the Dept. of Landscape Architecture and Women's Studies Program there. Anthony has been teaching architecture and been involved in research since 1984. Her courses focus on how people relate to spaces, how people relate to their housing environments, gender and racial issues in architecture and the application of environment-behavior research to design. Her courses stress social, psychological and environmental issues in architecture and architectural education. She seeks to develop more socially responsible designers and more environmentally responsible social scientists. 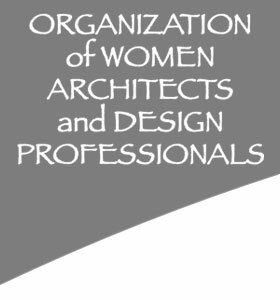 Her book Designing for Diversity:Gender, Race and Ethnicity in the Architectural Profession (U of Ill. Press, 2001) is based on surveys, interviews and archival data from over 400 architects. It highlights both the turmoils and triumphs of the profession, as it offers ways to make architecture a more diverse profession. Design Juries on Tiral: The Renaissance of the Design Studio (NY:Van Nostrand Reinhold, 1991) provides a guide for students to master the design jury and design studio both in school and in practice. 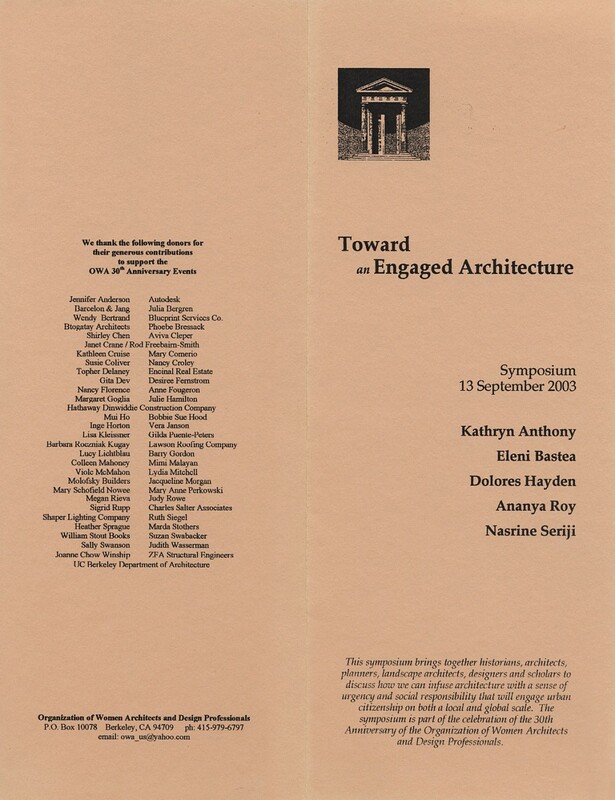 Ms. Anthony was co-editor of Gender and Multiculturalism in Architectural Education, JAE (47:1, Sept 1993) . She was the co-designer and co-producer of an exhibit in the 1996 AIA National Convention. She is the author of Shattering the Glass Ceiling: The Role of Gender and Race in Architectural Profession. Assistant professor at the University of New Mexico School of Architecture and Planning, Eleni Bastéa holds an M.Arch. and Ph.D. from Berkeley. Her research explores the development of modern Greece. In her book The Creation of Modern Athens: Planning the Myth and other publications, Bastéa demonstrates how architecture and planning became tools for the creation of a sense of Greek national identity. Professor Bastea teaches World Architecture and Indigenous Cultures, a survey course on ancient architecture with a particular focus on the Mediterranean basin. As co-chair of a conference entitled "Linking Memory and Space", Eleni Bastea remarked "memory in the making, understanding and teaching of architectureŠprovides the stage on which we enact our lives; memory creates a special relationship with space." She gave a lecture entitled "Between Home and Nation: Memories of Place in Modern Greece" at the conference Modern Greece and its Monuments at Yale University this past spring. She presented "Cartographies of History and Space: Reading Greek and Turkish Urban Novels" as part of a panel discussion on history and fiction at the Modern Greek Studies Association symposiom at Princeton in 1999. Dolores Hayden, urban historian and architect, is Professor of Architecture, Urbanism, and American Studies at Yale University. Hayden has written extensively about the history of American urban landscapes and the politics of design. Her early books include Seven American Utopias: The Architecture of Communitarian Socialism, 1790-1975 (MIT Press, 1976); The Grand Domestic Revolution: A History of Feminist Designs for American Homes, Neighborhoods, and Cities (MIT Press, 1981); and Redesigning the American Dream: The Future of Housing, Work, and Family Life (W.W. Norton, 1984, rev.ed., 2002). As founder and president of The Power of Place, a non-profit arts and humanities group based in Los Angeles from 1984 to 1991, Hayden laid out a downtown itinerary to celebrate the historic landscape of the center of the city and its social diversity. Under her direction, collaborative projects on an African American midwife's homestead, a Latina garment workers' union headquarters and Japanese-American flower fields engaged citizens, historians, artists, and designers in examining and commemorating the working lives of ordinary citizens. The Power of Place: Urban Landscapes as Public History (The MIT Press, 1995), documents this work. Currently Hayden is writing a new history of suburbs, Building American Suburbia: Green Fields and Growth Machines, 1820-2000. Ananya Roy is Assistant Professor in the Department of City and Regional Planning at the University of California, Berkeley, where she teaches urban studies and development planning. She holds a B.A. in Comparative Urban Studies from Mills College and an M.C.P. and Ph.D. from Berkeley. Roy's forthcoming book A Requiem for the City: Gender and the Politics of Poverty (University of Minnesota Press) shows how the city is produced through the hegemonies of class and gender through the example of Calcutta. Roy will co-edit and contribute two pieces to Urban Informality in an Era of Liberalization: A Transnational Presence. Roy's teaching commitments are located in both the undergraduate and graduate levels of the UC Berkeley City and Regional Planning curriculum. Her current undergraduate courses include Urbanization in Developing Countries and Housing: An International Survey. Her current graduate courses include Urban and Regional Development: Ideas and Practices and Qualitative Research Methods for Planners. Along with colleagues in the department and college, she is in the process of articulating an Urban Studies undergraduate major and developing a new college-wide course, The City as a curricular cornerstone of the new program. Born in 1957 in Tehran, Nasrine Seraji studied at the Architectural Association in London before founding her own studio, Atelier Seraji, in Paris. Seraji won the competition for the Temporary American Center in Paris. Her design, a melange of concrete and patterned brick in contrasting tones incorporated 21 trees already on the site. Architect of the Pavilion of the Caverne du Dragon in the north of France, she is presently building housing complexes in Paris and in Austria while continuing to participate in a number of competitions. Seraji has taught design in several architecture schools, including the AA in London and at Princeton University. She has also held visiting professorships at Columbia and Tulane Universities. Formerly director of the one of the two Meisterschule at the Akademie der Bildenden Kunste in Vienna, she is currently the Chair of the Department of Architecture at Cornell University in Ithaca, New York. Seraji has exhibited widely, including at the Galerie d'Architecture in Paris, the Royal Institute of British Architects in London and the Venice Biennale. Her work and writings have been featured in publications around the world, and she has lectured extensively in the United States and Europe. Liliana Beltran has recently finished a stint in Kuwait working as a UNESCO consultant. While in Kuwait, Liliana, Sheikha Hussah al-Sabah, and a team of UNESCO multi-disciplinary experts worked on the restoration of the Kuwait National Museum. The scope of work included security upgrades and architectural and interior design. The museum houses the largest collection of Islamic Art in the Arab world. The original museum was designed by Echochard, a French architect, in the 50's, but was not completed until the 70's. Liliana has found a new position at Texas A&M, teaching Ph.D., Masters and undergraduate students at the College of Architecture. Hope Coffin has a cross-disciplinary practice incorporating architecture and landscape design. Her business, Delightful Gardens, was established in 1994. Prior to her landscape work, Hope worked as an architect for Bennett Christopherson for seven years. In her landscape design she focuses on the effects of the shape of space. She is interested in people's kinesthetic response to hills, valleys and ridges. Hope came from a landscape tradition with her mother and stepfather landscape architects, and her sister a horticulturist and garden designer. While touring Europe for a year during her Masters at UC Berkeley, she worked with a firm on the design of a mosque for the King Fahd Academy for Muslim Children. The newsletter archive on the website now reaches back to mar/apr 2002 issue. We will post Latest Newsletters for your convenience. We will be launching the 30th Anniversary Celebration calendar, with all the details. For the most current information on OWA events, please refer to the website.